A good digital thermometer is really a must have in any cook’s home, whether they be amateur or professional, modernist or traditional. It ensures your meat and fish are cooked to the proper doneness and gets your oil to just the right temperature for that perfect crunch. 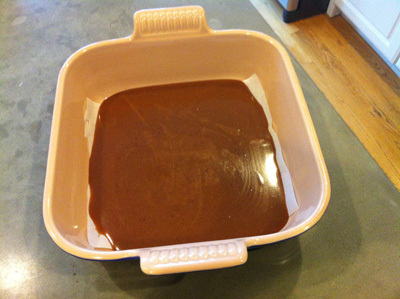 While this item might be the mainstay of any kitchen, it seems to be rather tricky for manufacturers to get it right. I’m on my third thermometer this year after the first one quick during a 6 course New Year’s Eve dinner and the second blew out during another 5 course party. After several tries, I eventually went back to my original purchase feeling it lasted the longest of all my buys. If deep frying is your main use for a digital thermometer, you may also be interested in my reviews of induction burners, which get the oil to the right temperature quickly; and more importantly, keep it there. Here’s the low down on the thermometers I’ve tried. 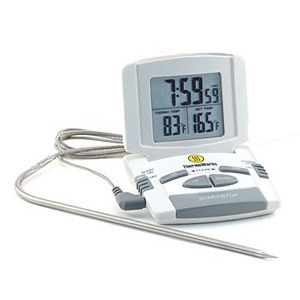 This is a sturdy well made meat thermometer that accurately judges the standard range of meat and fish temperatures. I’ve had this thermometer for several years now and it’s never let me down on the basics. The issue with this thermometer is that it doesn’t work well (at all) with fryers and their 300°F + temperatures. It was off by a long shot when I calibrated it. Additionally it doesn’t have a way of working while inside an oven or mounting to a deep sided pot. 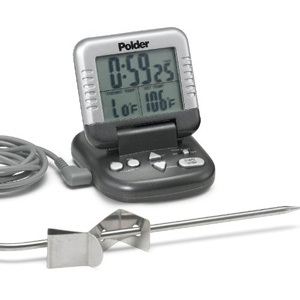 If you want a standard probe thermometer to check for meat and fish doneness, this is a cheap and reliable option and you can find it for a great price here. If, however you are looking for something a bit more reliable, read on my friends. I’m on my second Polder thermometer after the first crapping out on New Year’s Eve, trying a different model (see below), and finally returning to this one. Although it did eventually die on me, I had it for over two years and used it several times a week at extremely high temperatures. I also abused the hell out of it, dropping the entire probe in 375°F oil, routinely knocking it on the floor, and dousing it with any number of liquids. I can’t say that I blame it for finally giving up on me, though it could have chosen a better time. 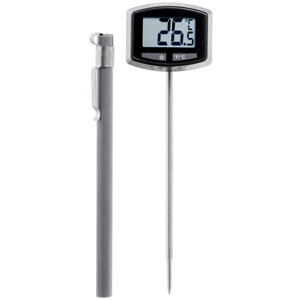 This model has a long chord attached to the probe so you can safely monitor the internal temperature of anything you might have in the oven or in the fry pot. I’ve done some calibration with boiling water and found it to be just about right on 212°F. It has a great timer and alarm function so you don’t have to constantly check the display. And for around $25 (here) it’s really a great value for money compared to some other versions. It’s because of all this, I’ve come back to the Polder brand and so far have not been disappointed. Take a look at prices and reviews here. Ok, so this thermometer gets rave reviews on Amazon…but I’m not buying it. I purchased this item less than six months ago and already after quite limited use, it died on me. Actually it didn’t die, it went completely bezerk and became extremely unpredictable. It would start the timer randomly, turn the alarm on and off constantly, and generally not accurately reflect the temperature of whatever I was heating by upwards of 50 degrees. Don’t waste your time or money on this, but have fun reading bad reviews here. If you want a real thermometer, go with the Polder Digital In-Oven Thermometer / Timer, I promise it’s a way better investment.